The GEM Project Research Exchange is a forum for economists who believe that macroeconomics must be both coherent and stabilization-relevant. We invite you to contribute your own research and comments on workplace-exchange economics, including its implications for stabilization policymaking. 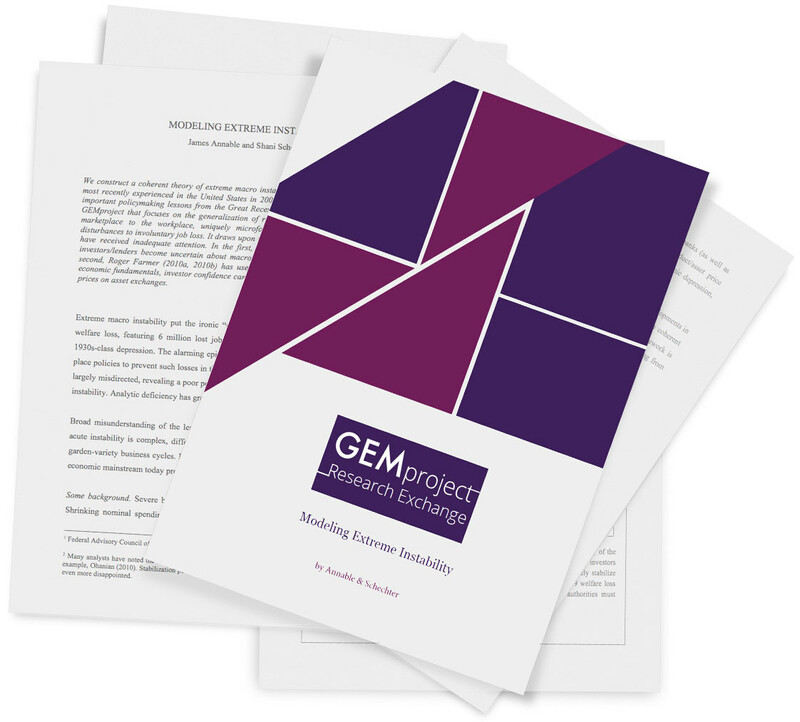 Research papers contributed to the GEM Project will be hosted on this site. Comments and paper submissions are encouraged. We construct a coherent theory of extreme macro instability, an important macro phenomenon most recently experienced in the United States in 2008-09. The model is then used to identify important policymaking lessons from the Great Recession. It draws upon two recent contributions to the literature that have received inadequate attention. In the first, Nancy Stokey (2009) demonstrates that, as investors/lenders become uncertain about macro prospects, inaction becomes rational. In the second, Roger Farmer (2010a, 2010b) has usefully repackaged an old idea: Independent of economic fundamentals, investor confidence can influence, and is influenced by, the behavior of prices on asset exchanges. The analysis centrally features central bank credibility and is part of the ongoing GEM Project that uniquely microfounds causation from adverse nominal disturbances to involuntary job loss.